Purim is finally here! 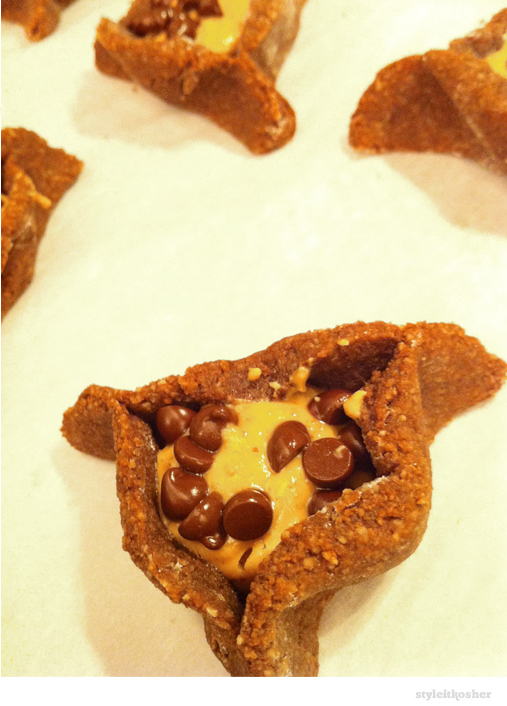 To conclude this week’s daily hamantaschen countdown is a recipe that’s heaven for the gluten-free peanut butter and chocolate fiend. Recipe adapted from Elana’s Pantry. I’m off to give out my hamantaschen boxes! For the gluten-free recipients, they’re getting the aforementioned Chocolate-Peanut Butter Hamantaschen along with the Gluten-Free Pecan Pie Hamantaschen. And for those who have a more lenient diet, they’re getting Lemon Bar Hamantaschen, Chocolate-Filled Hamantaschen, and ones filled with a variety of jams. Purim sameach! 1) In a large bowl sift, then stir together almond meal, cocoa powder, and salt. 2) In a smaller bowl, sift palm sugar and then stir warm water until it’s mostly dissolved. 3) Pour palm sugar syrup into dry ingredients bowl and mix until combined to a soft dough-like consistency. 4) Scoop tablespoon sized balls of dough onto a parchment-lined baking sheet. 5) Press each ball flat with palm of hand until dough is round and about ¼” thick. 6) In a small bowl, mix peanut butter with ½ tsp potato starch and 2 Tbs palm sugar. 7) Scoop ½ teaspoon of peanut butter mixture into center of each dough circle. 8 ) Fold dough in to create 3 sides, pinching each of the 3 corners to form a triangle-shaped cookie. 9) Sprinkle each cookie with mini chocolate chips. 10) Bake at 350°F for around 8 minutes until cookies are golden brown around the edges.